Click on the below headings to open and close further info. VOCAL ALCHEMY METHOD of singing - renowned for its proven success. New artistic and vocal techniques are introduced in every one of the 32 comprehensive video singing lessons (30-60 mins). Lessons 1-11 focus on expanded self-awareness and vocal release techniques - essential skills for ANY style of singing. Lessons 12-21 focus on specific classical and contemporary techniques for increasing freedom, resonance, range and vocal tone. Lessons 22-32 focus on belting, advanced techniques for contemporary mixed voice and 'Rock-God Voice' for those of us who want to master extreme pitch contemporary vocals! Designed for beginner to professional singers, relevant singing exercises are included in every lesson as downloadable mp3s so you can practice your singing anywhere, on any device. Specially written songs are introduced during lessons to help you incorporate new techniques into actual songs, not just exercises. 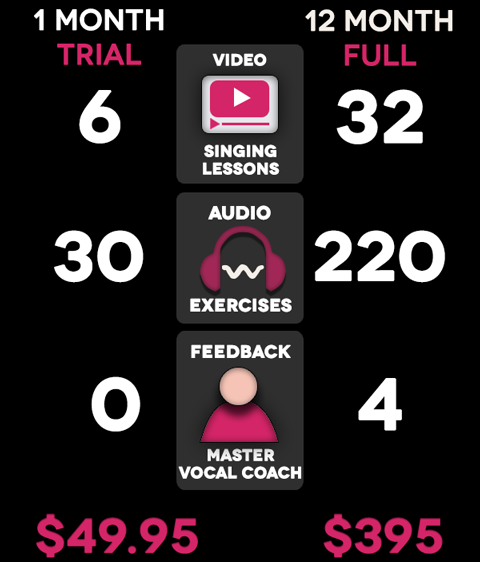 You will also receive 4 rounds of personal feedback from Master Vocal Coach Tim Smith & gain access to ALL of our 7 minute lessons (valued at $280) when you purchase the 12 month subscription for $395. Or our 1 month trial is also available for $49.95. Provides targeted video lessons (7-10 mins) that focus on specific vocal techniques and problems. These singing lessons can be purchased individually for $3.99 each and will be available for you to watch for 7 days. Categories like BETTER BREATHING and MORE VOCAL FREEDOM provide multiple lessons that will help you fix a specific vocal problem with a concentrated burst of new technique: SUPER TECH - SUPER FAST. Every lesson includes a carefully chosen singing exercise that reinforces the new technique covered in that lesson. There are more than 40 lessons available in the 7 MINUTE VOCAL SERIES. then click on the lesson to purchase. Your journey begins here, into the limitless vocal freedom, expression and magic that is the world of Vocal Alchemy. Click on the video thumbnails to the left to begin. 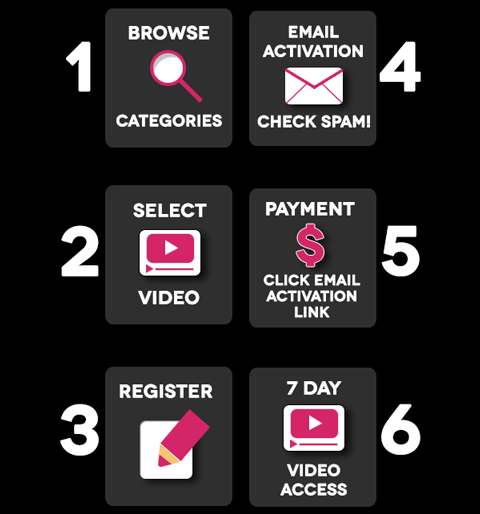 Not a registered user yet? Click here to SUBSCRIBE for instant access to the entire lesson series. A thousand breaths, a thousand sounds. That's the heart of Vocal Alchemy and we begin exploring this by sharing around the love! Pushing and pulling at the same time gets you nowhere! It's time to let go and begin to fly! Many singers try to shove square pegs into round holes when they sing. Bad idea! Are you one of those? Maximise every sound you make with your free, inbuilt amplifier! Musicians blow into trumpets, flutes and saxophones in three very different ways. With your voice, you can do the same too! Sit-ups are for the gym! Let's begin looking at what "supporting the voice" REALLY means! Having trouble singing higher? Then learn to get out of first gear! Massively improve your singing with these simple yet super-effective ideas! By now you've got lots of new skills. Let's go over them one more time. Now that you've got the basics mastered, it's time to speed everything up and see where all this dedicated work can really take you. Classical singing 101! This is the fastest easiest way to unlock those classically-based sounds you always thought were too difficult! Go on! Move all those odd things in your throat ...I dare you! Freer sound than you ever imagined possible! And you don't even do it with your voice you do it with your heart! How easy is that?! Don't get left behind. Stop here for a wine - or perhaps a coke - and take in the nice view. Don't miss anything! Amazing ideas that simplify singing higher in any style. It really works! THE contemporary singing secret that helps you sing even higher. And best of all it's really easy and feels great! You really shouldn't put garlic, pepper or coriander in a chocolate cake but in your singing you can do anything and this lesson shows you how! Don't get left behind! Take the time to smell the roses here for a moment. You've waited long enough! Now it's time to begin releasing your inner ROCK GOD! Let's make your belt rock-solid and safe as the Bank of England! When some singers belt it sounds like awful yelling and you just want them to stop! Use these Vocal Alchemy techniques to belt with all the heart you can muster and begin wearing your ROCK GOD badge with pride! Some of those African singers sound sooooooo...well you know how they sound! Here are their secrets. Now you try! Phew! I'm exhausted after all that belting! Let's settle down and make sure we've got all the bits of the puzzle in the right place. The onion just keeps getting taller and fatter all the time! PERFECT! Everything you ever wanted to know about vibrato but were afraid to ask and Tim shows you how! If you want bland singing...go somewhere else! If you want to sing with all the colours of the rainbow make this lesson an essential part of your singing toolbox. Let's put it ALL together into one simple, logical and practical package that you'll wish you learnt years ago! The Problem: Singing is different from speaking but most people don't know HOW! Do you? The Problem: Singing breath is always more dynamic than normal breath. Can you make the change? The Problem: Classical singing doesn't just mean opera! Are you ignoring these fundamental techniques?